By October 26, the 28th Division, commanded by Major General Norman D. Cota had relieved the 9th Division in the Hurtgen Forest. It now was to accomplish what the 9th had failed to do: to capture Schmidt. In conjunction, Major General Lunsford E. Oliver´s 5th Armored Division was to attack up the Monschau Corridor from Lammersdorf. The original target date for the VII Corps offensive was November 5. Therefore, V Corps was instructed to start its attack no later than November 2, regardless of the weather. However, much of the reason behind this order ceased to exist on November 1, when, because of the atrocious weather, the main drive was postponed five days, to the 10th. Yet, 28th Division´s attack was not changed accordingly. As it happened, the division found itself to be the only allied attacking force along more than 170 miles of front, from Holland to Metz, and left to the wrath of German reserves. For the attack on Schmidt, the 28th Division was strongly reinforced. Besides the usual battalion of tanks and tank destroyers, it was given a chemical (4.2 inch mortars) battalion, a battalion of towed anti-tank guns, the entire 1171st Engineer Combat Group; and, in view of the rough terrain, 47 M29 Weasel carriers. In support were some eight battalions of corps artillery. Available for air support were six fighter-bomber groups and one night bomber group. On the German side, the 275 Infanterie-Division still held the forest. By now, General Schmidt had organized his rag-tag assortment of troops into three regiments: the 983, 984, and 985. On the right, the 110th Infantry (Colonel Theodore A. Seely) was to attack southwards, break past the Raffelsbrand road junction and open up an alternative route into the Monschau Corridor. But this part of the forest was thick with pillboxes, log emplacements, and concertina strands and alive with trip wires, mines and booby traps. Both attacking battalions of the 110th, after hours of painful, costly infiltration attempts, reeled back dazed and stricken, to their line of departure. Attacks on the second day proved even more costly and less rewarding. 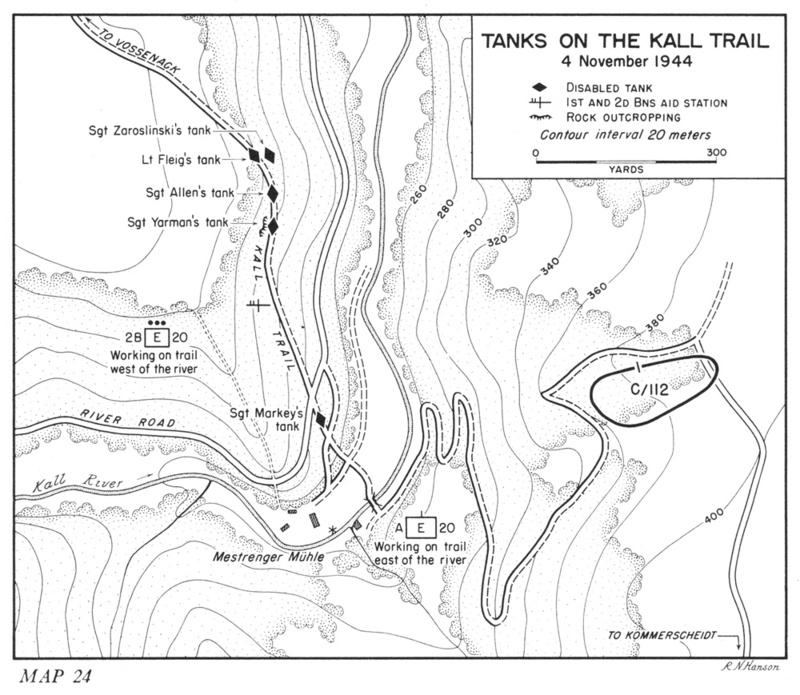 On the 4th, the reserve battalion tried a left flanking maneuver, down into the Kall Gorge to the hamlet of Simonskall. Although it seized the hamlet, the stalemate at Raffelsbrand was not broken. The pillbox-studded gap between the battalions could not be closed. The exercise in futility continued for nine more terrible days. The lines at the end remained almost the same. On the 13th the attack was called off. On the division´s left, the 109th infantry (Lieutenant-Colonel Daniel B. Strickler) was to advance north-westward, astride the Germeter-Hurtgen highway, and gain the woods line overlooking Hurtgen. The purpose of this was to prevent a repetition of the counter-attack against the north flank, like that experienced by the 9th division. On the first day, the battalion west of the highway did reach the woods line, but the battalion on the road itself was stopped after only 300 yards by a dense anti-personnel minefield covered by machine guns. Attempts to outflank it next day failed because of two German counter-attacks on the battalion in the woods, which caused general confusion on the American side. For the next few days this situation continued. While the Americans had forged a narrow, mile-deep salient up the wooded plateau between the Weisser Weh and the highway, the Germans held on to either side of it. Even commitment of the reserve battalion on the 4th did not change the balance, for the Germans had been reinforced too by Panzergrenadier-Regiment 60 (Oberst Heinrich Voightsberger) of 116 Panzer-Division. Meanwhile, casualties, mainly from tree bursts, soared. on the 6th, prompted by catastrophic events in the 112th infantry´s sector to its right and on direct orders from V Corps, the 109th infantry was relieved by the hurriedly alerted 12th Infantry of the 4th Division. Though mutilated, the 109th was required as fire brigade reserve to stave off further disasters at Vossenack. The 112th Infantry (Lieutenant-Colonel Carl L. Peterson), attacking in the center, had had the main task. It was to attack east from Germeter, capture Vossenack, then thrust across the deep Kall Gorge to reach first Kommerscheidt and finally Schmidt, the division objective. The start on November 2 was promising. With tank support, one battalion by early afternoon had taken Vossenack and reached the end of the ridge on which it lies. But the battalion that was to advance across country to Schmidt immediately came under intense fire and was pinned down for the rest of the day. From Vossenack to the south-east, the map showed a narrow, two-mile-long cart track dropping precipitously to the Kall River, then rising tortuously to Kommerscheidt and along a spur to Schmidt. Its condition was unknown. on aerial photographs parts of it did not show up. 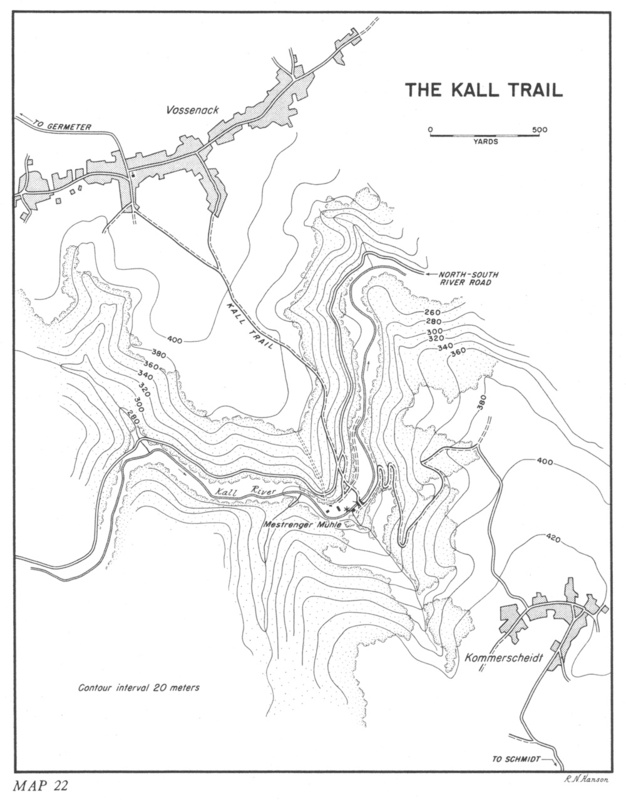 On both sides, the Kall Gorge led into German-held territory. Yet this trail was not only chosen as the 28th Division´s axis of attack, but also its main supply route. In actual fact, the trail was just a narrow shelf, at places only nine feet wide, limited abruptly on one side by a dirt wall studded with rock obstructions and on the other by a steep drop. At the bottom of the gorge, near an old sawmill called Mestrenger Muhle, a stone arch bridge forded the icy, swift-flowing Kall River. 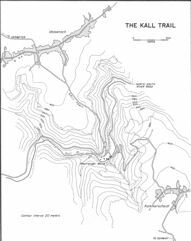 The first American troops to descend the trail were two battalions of the 112th Infantry, early on November 3. Marching down in column from Vossenack and up the other slope, they successfully — and to everyone´s surprise — reached first Kommerscheidt and then Schmidt. By nightfall, one battalion was in each village and organized for defense. However, they had no anti-tank weapons other than bazookas and mines and the need of getting armor across the Kall Gorge grew urgent. Late on the 3rd, in gathering darkness Company A of the 707th Tank Battalion under Captain Bruce M. Hostrup made ready to try it. Leaving the bulk of his tanks near the point where the trail enters the woods, Hostrup himself continued in his command tank to reconnoiter. About a quarter of the way down, the trail became narrow and slippery. The left shoulder began to give way under the weight of the tank. The rocky outcrops on the other side denied movement to the right. The tank slipped and almost plunged off into the gorge. Returning to his company, Hostrup reported the track impassable. The 20th Engineer Combat Battalion was ordered to work on it throughout the night, so that Hostrup´s tanks could try again in the morning. The engineers had only hand tools with them and no explosives. A bulldozer and air compressor only reached the site at 2:30 a.m., the bulldozer breaking down after one hour´s work. The trail had been little improved when Company A started its second attempt, about an hour before dawn on the 4th. The lead tank of 1st Lieutenant Raymond E. Fleig had just entered the woods when it struck a mine, partially blocking the trail. By using the tow cable from Fleig´s tank and the tank itself as a pivot, the tankers finally winched four Shermans past. Fleig then boarded the lead tank and by tortuous backing and turning finally reached the Kall to begin the toilsome last lap to Kommerscheidt just as day was breaking. Behind him he left the shoulder of the trail horn and crumbling. The other three tanks of his 1st Platoon followed him down with utmost difficulty and caution. They encountered a particular problem at one point where a projecting outcrop of rock made it impossible to hug the right side of the trail. Here, Sergeant Jack l. Barton´s tank threw a track. The next in line, Staff Sergeant Anthony R. Spooner´s, towed it back onto the trail and the track was righted. 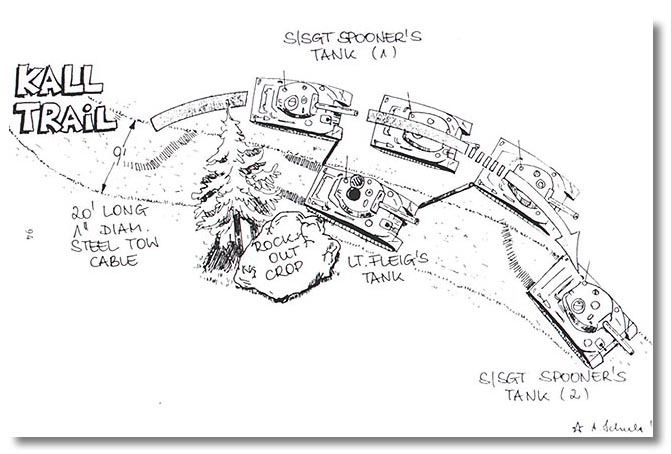 Using Spooner´s tank as an anchor, Barton then successfully rounded the curve. In this way, the other two made it past as well. But near the bottom of the gorge, the last of the three tanks, Sergeant James J. Markey´s, stuck in the mud and threw a track. Only three tanks were now beyond the river and on the way to Kommerscheidt. Behind them, the rest of Company A, eight Shermans, were still held up by Fleig´s abandoned tank. Attempting to pass it, Staff Sergeant Anthony S. Zaroslinski´s tank plunged off the left shoulder to the trail. Using this wrecked tank as a buffer, two more tanks inched past: but near the rock outcropping both slipped of f the trail and threw their tracks. Five disabled tanks now sat on the vital trail. Not even the dexterous Weasels could slip through. Meanwhile, at Schmidt, disaster had struck the 112th Infantry. This had come about by chance developments on the German side. On November 3, the 89. Infanterie-Division had been relieved at Lammersdorf. Withdrawing north-east through Schmidt, its Infanterie-Regiment 1055 had been cut in two by the American capture of Schmidt, for one of its battalions had yet to pass through the village. Thus, by chance, the regiment found itself in a ready-made encirclement of Schmidt. Also by pure coincidence, when the American attack began on the 2nd, a map exercise of German army, corps, and division commanders was in progress at Model´s army group headquarters near cologne. Its subject was a theoretical attack on Hurtgen. When news of the actual attack came in, the conference continued with this as subject. Also, Model freed the 116. Panzer-Division (GeneralMajor Siegfried Von Waldenburg) to assist in countering the American penetration. Its Panzergrenadier-Regiment 156 went to Vossenack; Panzergrenadier-Regiment 60 to Hurtgen; and Panzer-Regiment 16, with some 25 tanks, to Schmidt. At dawn on the 4th, the combined force of Panzer-Regiment 16 (Oberst Johannes Bayer) and Infanterie-Regiment 1055 struck at Schmidt from both north and south-west. Unable to stop the armor firing point-blank into houses and foxholes, the American battalion broke. About 200 men fled to the east, deeper into enemy territory, and were not seen again. The rest fell back in chaos on Kommerscheidt. Only 200 stopped and joined the other battalion. Soon the German onslaught reached Kommerscheidt. The day might have been lost save for Lieutenant Fleig´s three tanks. In tank-to-tank duels, the Shermans knocked out three Panzers. A bazooka disabled another and a P-47 a fifth. By 4:00 p.m., the Germans had begun to fall back. From his command post back at Rott, General Cota now ordered an attack to retake Schmidt. But Colonel Peterson realized he would be lucky if he could only hold Kommerscheidt. That night, another unit from 89. Infanterie-Regiment 1056 (Oberst Eberhard Roesler), arrived from Lammersdorf to strengthen the German ring around the Americans. The crisis at Schmidt doubled the urgency of opening the Kall trail and getting armor to Kommerscheidt. Yet, all through the 4th, the engineers and tankers, instead of pushing the disabled tanks off the trail into the gorge and use explosive on the troublesome outcrop of rock, worked to save the tanks, righting the tracks only to watch them jump off again after a few yards. Not until 2:30 a.m., November 5, did general Cota intervene with an order to roll four of the tanks down the slope and to blow the rock. Sergeant Markey´s tank, stuck near the river, could be bypassed using a ‘switchback’ route of two other tracks. the trail finally open, five supply Weasels, nine M10's of Company C, 893rd Tank Destroyer Battalion, and the six remaining tanks of Hostrup´s Company A crossed the river early on the 5th and joined the defenders of Kommerscheidt. With these, the remnants of the 112th Infantry held off repeated German strikes during the day. Also, clearing weather for the first time enable dive-bombers to really support the ground troops. That night, recce troops of Panzer-Aufklarungs-Abteilung 116 entered the Kall Gorge from the north, along the track parallel with the river. The 20th Engineers, who were responsible for defending the trail, had only a four-man security guard at the bridge, but no one along the trail itself. In the darkness, the Germans easily reached and severed the vital trail. Although they mined the track, the cut was not complete: through the night, some Americans were ambushed, other traversed the gulch unhindered. Meanwhile, back at Vossenack, another crisis had arisen that threatened the very existence of the 28th Division. Under observation from enemy artillery massed on the Brandenberg-Bergstein ridge, and unnerved by three days and four nights of merciless shelling, the battalion of the 112th Infantry holding the bald, exposed Vossenack Ridge, cracked. At daybreak — not because of any counter-attack, but simply because its nerves had gone — one company panicked and broke. Within minutes, the whole battalion was on the run, streaming past the village and to the rear. Only the attached armor stayed in place. To deal with the crisis, the Assistant Division Commander, Brigadier General George A. Davis, had only engineer troops left. The 146th Combat Engineers were sent into Vossenack to man a thin line at the village church. The 1340th and the remnants of the 20th Engineers were sent to the Kall Gorge, which, to their surprise, they found empty of Germans. Next morning, just beating Panzergrenadier-Regiment 156 to the attack, the 146th Engineers charged forward from Vossenack and restored the former positions on the ridge nose. But in the Kall Gorge, the situation was less lucid. 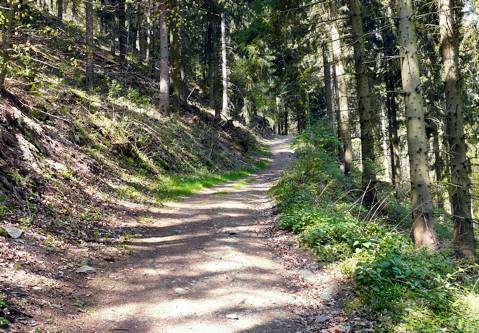 During the night, Aufklarungs-Abteilung 116 had move back in and again cut the trail, this time making contact with Infanterie-Regiment 1056 which had entered the ravine from the south. Yet, in these same hours, an American supply column crossed and recrossed the Kall. On the 7th, General Cota formed another task force, under General Davis. Apart from the infantry and armor already in Kommerscheidt, it was to consist of a battalion of the 109th Infantry, just relieved after four days of crippling combat, and a company each of tanks and TDs. Its task was, again, to retake Schmidt. But Task Force Davis never got to Kommerscheidt. Four of the M10s, of Company B, 893rd Tank Destroyer Battalion, were knocked out on the open ridge even before they reached the point where the trail entered the woods. Another battalion of the 109th, ordered to secure the gorge, got lost and ended up near Richelskaul. Meanwhile, at Kommerscheidt, the 89. Infanterie-Division had gone in for the kill. Two battalions and some fifteen tanks attacked the depleted Americans in full force. In a pitched fight, the Americans knocked out six Panzers against three M10s and two Shermans lost. (In the middle of the fight, an erroneous message directed Colonel Peterson to report immediately to the division command post, leaving Colonel Ripple in command. Peterson made his way back. When Cota saw Peterson arrive, exhausted, twice-wounded and semi-delirious, the general fainted.) By noon the Germans had reduced the village. 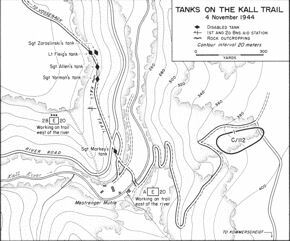 Driven out, the last Americans, with only two TDs and one tank left, narrowly held on to the woods line above the Kall Gorge. The catastrophe at Vossenack on November 6 and at Kommercheidt on the 7th finally brought home the plight of the 28th Division to higher commanders. Initial optimism turned into sharp criticism; unrealistic schemes for attack gave way to more realistic views. Late on the 7th, General Hodges of the First Army approved the withdrawal of all troops from beyond the Kall. Another day, November 8, was needed for Task Force Davis to attempt to secure the western slope of the gorge. Meanwhile, a new commander for the 112th Infantry, Colonel Gustin M. Nelson, proceeded to Kommerscheidt. That night, in pitch darkness and under a cloak of artillery fire, the survivors made their way back. While a column of wounded and litter bearers marched openly down the trail, a line of effectives moved back across country. In both, because of the blackness of the night and German shelling, all formation was quickly lost. Alone, or in small groups, the men forded the icy Kall, but of the 2,200 men that had crossed to the east bank, barely 300 came back. 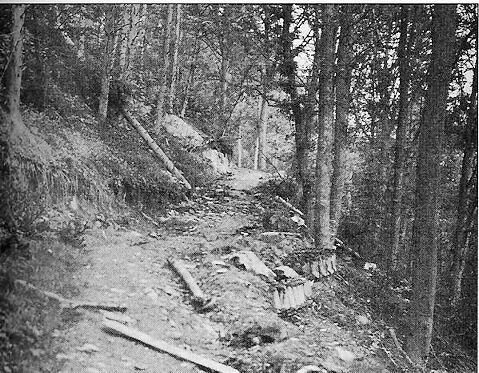 The medics and patients of the American aid station along the Kall Trail, left behind in no man´s land in the confusion of the withdrawal and for two days virtual prisoners of the Germans, did not get out until late on November 11.
on Vossenack side of gorge. Note thrown tank tracks on the right. The second attack on Schmidt had developed into one of the most costly US divisional actions in the whole of the Second World War. In all, the 28th Division and attached units had lost 6,184 men. Hardest hit was the 112th infantry: 232 men captured, 431 missing, 719 wounded, 167 killed, and 544 non-battle casualties — a total of 2,093. Thirty-one tanks and 16 TDs had been lost. Losses in trucks, Weasels, anti-tank guns, machine guns, mortars, and individual weapons were tremendous. The Germans had lost heavily too: some 3,000 men and about 15 tanks. On November 13, First Army ordered the 8th Division to relieve the crippled 28th Division. The above article was the inspiration that led in 2002 to the creation of this website. Source: former website of the 707th Tank Battalion Association, which is alas no longer online. of the former 707th Tank Battalion Association website.